There are many benefits to membership at the Washington Foreign Law Society, including the opportunity to attend events alongside our distinguished Board of Governors. To get to know them better, WFLS will be interviewing some of our Board Members to showcase the unique and diversified talent behind the Society. 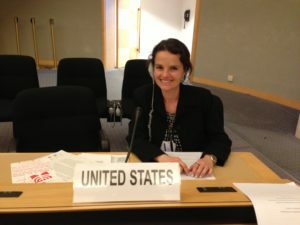 Our third featured Board Member is Sarah Prosser, Attorney-Adviser at the State Department. How did you come to work as an Attorney-Adviser at the State Department? Prior to becoming an Attorney-Adviser, I interned twice at the State Department–once for Diplomatic Security when I was an undergrad, and again during law school for the Office of the Legal Adviser. Can you talk about the role your work at State plays in implementing U.S. foreign policy and, more broadly, international governance? The Office of the Legal Adviser, or “L”—as we call it—has about 200 attorneys as the in-house counsel at State. The office provides legal guidance to Department policy makers in the formulation of new policies or the implementation of existing policies. We seek to ensure that U.S. foreign policy is in accordance with U.S. domestic law and our international obligations, such as those contained in treaties and agreements. How did your time in the Peace Corps influence your path to practicing law? In the Peace Corps, I was teaching students learning English and working with local women who were starting the first non-governmental organizations in Uzbekistan. It was extremely challenging, particularly in the aftermath of the Soviet Union, and, as such, it was a good reality check in terms of adjusting my U.S. perspective on the pace of what can be accomplished in a developing country. My Peace Corps experience reaffirmed my interest in foreign policy and international development, and it helped to inspire my pursuit of the law as a tool for societal progress. I attended a couple of the annual Diplomatic Receptions and found them to be fun events and good networking opportunities. I’ve had friends and former colleagues on the WFLS Board and was honored when I was asked to participate on the Board. As a public sector lawyer involved in U.S. foreign policy, what can you and others gain from participation in WFLS? WFLS offers many opportunities to meet a range of people working in international law and its many sub fields. Through events such as panels and brown bag lunches, WFLS also provides opportunities to learn about timely international legal issues of interest to members and anyone in the international legal field. Is there any advice you’d share with people considering a career in international law? A couple thoughts: First, while an interest in international law is usually a prerequisite for a job in international law, one starting out in international law should have examples of experiences that support that interest. Such examples could take many forms, such as classes taken in law school, independent international legal study, published articles, moot court, work as a research assistant to an international law professor, or work experience here or abroad in international law or even in foreign affairs more generally. Secondly, something I wish I had considered during law school is clerking for an international tribunal or court. These clerkships can be incredible experiences both for learning the substance of international law and in terms of legal apprenticeship more generally.